With a set up of violin, bass and drums, Paracelze are a Swiss trio who set about making highly post-produced, electronics-heavy instrumental avant-rock without any guitars in it. And although they firmly brand themselves as metal or rock, the result is sometimes more of an experimental electronica package than perhaps they want to admit. Over steady, assured and sometimes Silver Apples-ish drumming are laid dark concoctions of twisted sound, broken found sound samples and growling fury. Meanwhile the distorted violin and bass work is a more than adequate substitute for a standard electric guitar. “The Mystic Ride” shows off the balance nicely, ploughing a common but effective interplay between innocent-sounding xylophone-ish tones and gritty distortion underneath. It also demonstrates the band’s ability to “go pop” and step into more familiar-sounding arrangements that are accessible, and whilst they’re certainly not in the middle of the road, they are at least on a fairly major highway with it. This dynamic persists for the half-hour duration, exemplified by tracks like “Sand Cloud”, with laid-back wig-out sections initially pulling you one way before a dark distorted second half throws you in the opposite direction- immediately followed by the title track’s very short-lived headbanging crescendo. It’s an accomplished and nicely laid-out, compact little experimental album that is perhaps not as distinctive or unique as the publicity may lead you to believe, but if you like your rock both heavy but thoughtful, this is worth putting in your ears. When I receive a "new classical" music CD I always feel some anxiety; I'm often a bit out of my element and feel that I won't adequately be able to review and convey the work(s) as well as those who've had years of acquaintance with modern classical under their belts. 'LUX' allays that anxiety by presenting works that do not fall into the avant-garde, and speak more to the heart than to the intellect. Three works are to be found on this album, two by Norwegian composer Stale Kleiberg - "Hymn To Love," and "The Light," and one, "Requiem," by British composer Andrew Smith. The artists involved in realizing these compositions are the Norwegian artists, the Nidaros Cathedral Girls' Choir, under the direction of Anitak Brevik; TrondheimSolistene (strings); Ståle Storløkken (organ); Petra Bjørkhaug (organ); and Trygve Seim (saxophones). The real stars though are the glorious voices of the Nidaros Cathedral Girls' Choir. Through much of this it was difficult to keep tears from welling up in my eyes, and as jaded as I am, that doesn't happen very often. 'Lux' was commissioned from the composers to celebrate the 25th anniversary of the founding of Nidaros Cathedral Girls’ Choir (Nidarosdomens Jentekor) in 1992. The centerpiece (sandwiched in-between Kleiberg's compositions) is Smith's "Requiem," loosely based on the Roman Catholic mass for the dead, which takes up almost 46 out of 70 minutes of the album's length. Some of the texts in the traditional Requiem Mass have been replaced with biblical references to children in dire circumstances, in order to reflect modern tragedies in which the young are innocent victims, such as terrible massacres at Utoya and Oslo in 2011, the 2012 Sandy Hook Elementary School shooting, and the 2018 massacre at the Marjory Stoneman Douglas High School in Parkland, Florida. "Requiem" may seem like an odd choice for a 25th anniversary celebration, but once you hear it, you'll be enraptured by its beauty and sadness. Although the musical material in the Requiem takes its inspiration from Gregorian chant, Trygve Seim's emotive saxophone lends a modern touch that does much to contemporize the work, and even the organ parts played by Bjørkhaug have a more modern sound than traditional "churchy" solemnity. The choir sings in Latin, but there are English and Norwegian translations in the booklet. The girls' vocals are glorious and in combination with the splendid saxophone are sublimely moving. Anita Brevik must be commended on her excellent arrangement and conducting skills as well, synthesizing the voices of these young women into something heavenly and ethereal. Kleiberg's "Hymn To Love," which open the album takes its lyrics from the biblical 1st Corinthians 13, 1-13 - "If I speak in the tongues of men or angels, but do not have love..." and is sung in English. The Trondheim Soloists strings are pervasively expressive in this piece, and the composition is the perfect opener for 'Lux,' where an uplifting sense of hope and joy (which it most certainly conveys) is needed for what follows. Kleiberg's "Light" which closes the album features more of the Trondheim Soloists than the Girls' Choir, as it is nearly six minutes before the voices come in, and the piece is less than 10 minutes long. For me, this was the weakest part of the album, but it was still in keeping with the concept. The sound of course is superb and gorgeous, even just on the SACD which I listened to for the review. The second disc is a part Blu-ray audio, part data disc. It contains a 2.0 LPCM mix, a 5.1 DTS mix, a 7.1.4 Auro 3D presentation, and a 7.1.4 Dolby Atmos version that will play on home theaters that support a normal 7.1 configuration. Audiophiles should be in ecstasy over this. “Vegetal Negatives” is inspired by a text from René Daumal called “On pataphotograms”, which is described as ‘quasi-metaphysical essay that toys with breaking the conceived separateness of natural forms through poetic imagination’. And this 36-minute collection of processed environmental found sounds, resonant individual percussive noises and more abstract analogue synthesizer sounds, exemplifies the principle of breaking conceived barriers, to put it all into a melting pot and come out the other side with something that sounds pastoral, organic, yet also unfamiliar. Warm hums dominate at times, with “Coastal Inversion” imbued with an inexplicable feel-good factor that its more spikey tones can’t break. “Rooftop Gardens” feels more ‘ordinary’, portraying elements of a city-scape- public transport noises and general hubbub- and capitalising on our ability to identify music in the sounds of everyday life. “Symbiogensis” shifts gear, bringing more interior and internal sounds that elicit the most sci-fi moments, blended with muddy rustling sounds that invoke thoughts of scientific gardening. Final piece “Chora” continues into further introspection, providing smaller, more plaintive noises. It’s a rich and compact bit of sonic experimentation that’s imbued with character. It reminded me, positively, of John J Campbell works, particularly “40:00”, but with a somewhat more open stew recipe. A strangely feel-good and well-textured bit of sonic art. 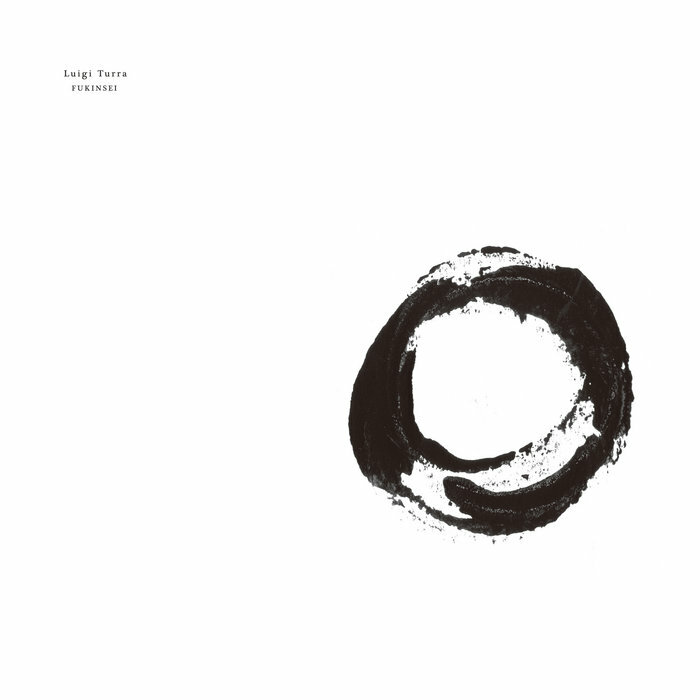 The works by Luigi Turra are somehow based on zen concepts and this one is no exception. "Fukinsei", which means roughly 'asymmetry', is one of the seven principles of zen aesthetics and is tied to the idea of an art based on a structure based on the form of the subject rather than on the intellect based concept of proportionality. So balance is something emerging from the act of working the matter rather than from the will of the artist. This album is divided in three parts: "Imperfection", in two sections, where isolated acoustic sound events are interleaved by episodic electronic ones in a background silence which requires a certain concentration to the listener to understand the criterion behind the sound disposition in time. "Asymetrie", in two sections", proceeds from silence to sound by accumulation until some seconds of silence introduces another iteration of this process. "Abrasivité", in five sections, could be a little misleading in the name as the title doesn't refer, intuitively, to noise but to the disruption of a quiet, and compact, music form, as the continuous tone, using isolated sound events as notes or voices. This release sounds far more meditated, and polished, than its title, and premises, could suggests, at least for my understanding of zen aesthetic, and results in a remarkable example of lowercase music that bring back sound to its status of sign rather than a percept. Listen with care.